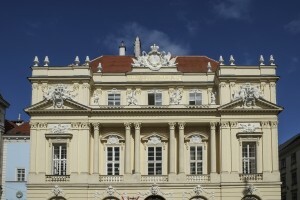 The Austrian Academy of Sciences (OAW) is Austria’s central institution for science and research. Founded in 1847 as a learned society in Vienna, the Academy currently has over 750 members and around 1,300 employees; it stands for the transdisciplinary exchange of knowledge, innovative basic research and progress for society as a whole. The OAW as a learned society cultivates discourse and the cooperation between science, the public, politics and the economy. Its members in Austria and abroad inject scientific insights into current social, cultural and political debates and create an awareness for urgent matters in Austria and throughout Europe. As the largest institution conducting non-university research in Austria, the OAW practices applied and open basic research at its institutes at the highest international level. The topical diversity ranges from archaeological research and cultural sciences to global demographic developments, quantum research and molecular biology. Specific areas of emphasis and strict evaluation processes ensure that all OAW research activities aim to provide benefits for society as a whole. As a public institution, the OAW advances national and international scientific cooperation, and supports up-and-coming scientists with fellowships as well as training. The OAW sustainably supports the development of Austria as an innovative and future-proof knowledge-based society.